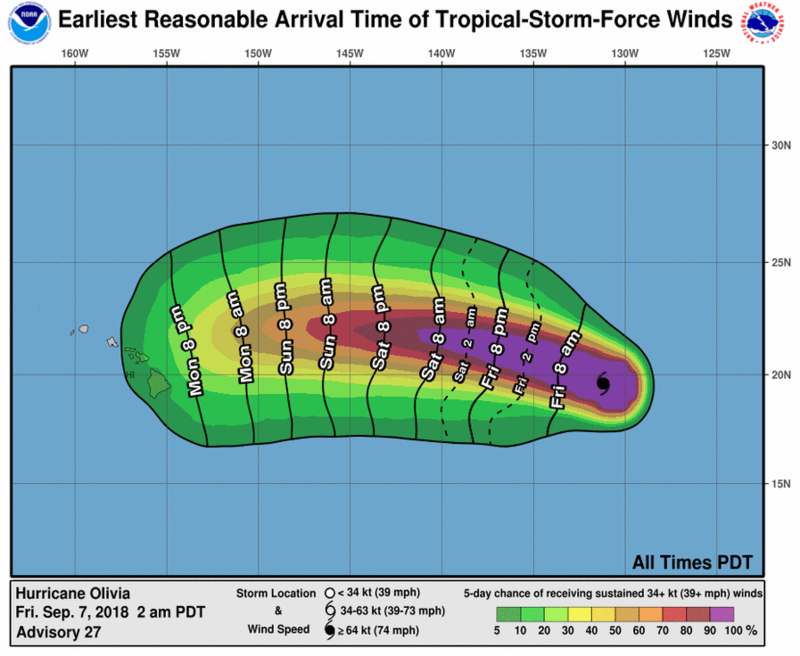 At 11 p.m. HST (0900 UTC), the center of Hurricane Olivia was located near latitude 19.6 North, longitude 131.2 West. 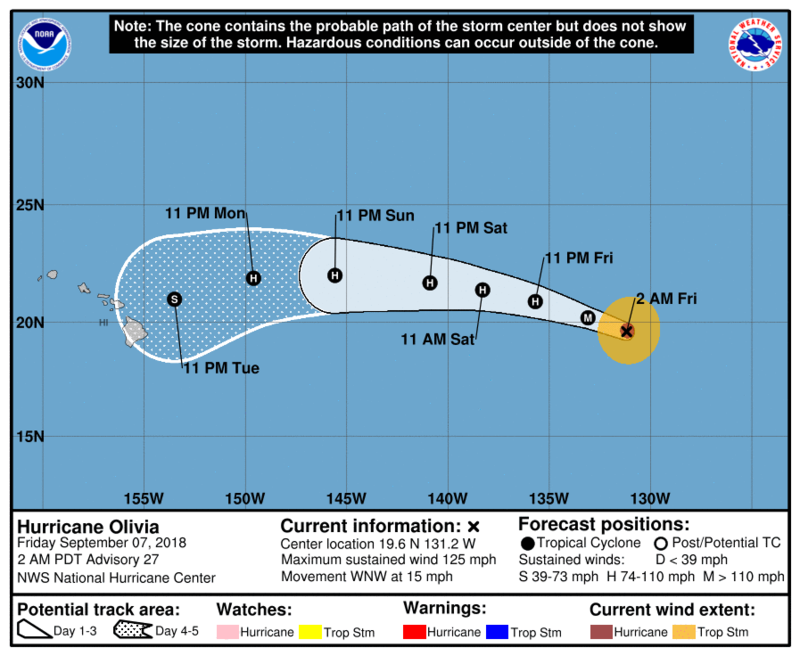 Olivia is moving toward the west-northwest near 15 mph (24 km/h), and this general motion is forecast to continue through Saturday. A gradual turn toward the west is expected Saturday night or Sunday. Maximum sustained winds have decreased to near 125 mph (205 km/h) with higher gusts. 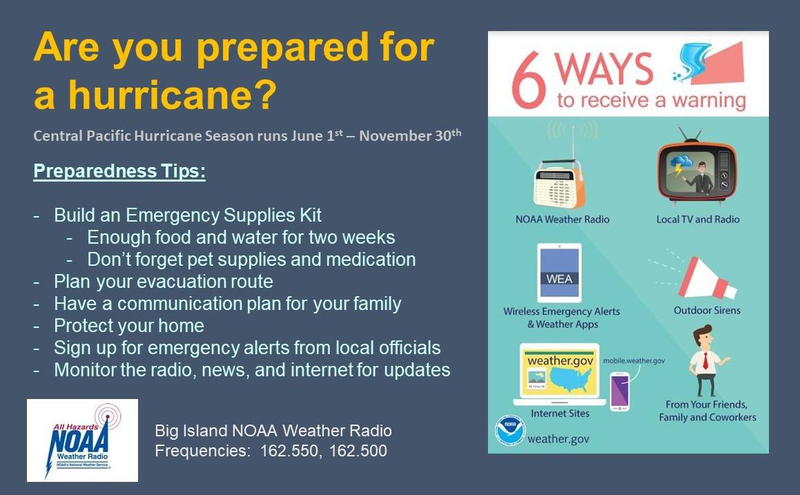 Olivia is a category 3 hurricane on the Saffir-Simpson Hurricane Wind Scale. A slow weakening trend is expected through the weekend. The current annular pattern indicates that Hurricane Olivia should weaken more slowly than indicated by guidance, even though the cyclone will be moving over slightly cooler sea surface temperatures (SSTs) of about 25.5 deg C by 36 hours. The low shear environment that the cyclone will be embedded in should help to offset some of the negative effects of the cooler waters. After that time, Olivia will move back over slightly warmer waters and remain in a low shear environment, so a little leveling off in the weakening process is forecast until 96 hours. On day 5, however, southwesterly vertical wind shear of 15-20 kt is expected to induce more significant weakening at that time. The official intensity forecast is similar to, but higher than, the consensus models, and more closely follows a blend of the dynamical models.